Posted On November 08, 2016 by Team iCynosure. No season feels more vibrant and fresh than fall. Maybe it's because of the amazing new clothes and styles that hit the fashion scene. Last year, knowingly or unknowingly all the fashionistas made similar purchases and the trends went out of stores pretty quickly. However do not go crazy snapping up every trendy piece of clothing or accessory you find, take a step back and pick the right pieces that will allow you flexibility in styling. Pick your fall staples from Zaful, just the way I’m picking mine today; from clothes to boots to bags to lingerie, click here to see the best new basics of the season. 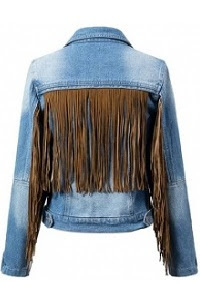 A Tassels Spliced Shirt Collar Denim Jacket that’s stylish, cosy, classy and perfectly cowboy ready. A metallic Backless Silver Evening Dress that takes you from oh to aww instantly without any fuss! A lovely Striped Off-Shoulder Jumper to bring some fun and loads of colour into the fall. A Plaid Sleeveless Maxi Top that you’ll probably want to live out of and wear all the time. A Bell Sleeve Totem Print Top that will bring many compliments your way. A Graphic Round Collar Short Sleeve T-Shirt that announces who the boss is. A Tie-Dyed Slip Dress that’s perfect to cuddle in while watching New Year Eve movies. A Star Pattern Faux Fur Jacket to run your errands in and a perfect cover-up on the go. A pair of Red Cross-Strap and Flock Pointed Toe Pumps that make you the talk of the town. A pair of White Tie-Up Round Athletic Shoes to either dress up or down. Zaful is your one-stop online shop for the most daring, exciting and edgy fashion brand, favoured worldwide due to their amazing delivery options, quality products and affordable prices. The collection is all about redefining trends and design excellence to satisfy the needs of every aspiring fashionista. So what’s your must-have fashion piece from my lust-list above?